1. Soak Basmati rice for 10 minutes. Wash and drain the rice and keep aside. 2. Add a little ghee in a pan and then fry rice till the rice colour changes to slight golden brown. 3. Now, in a deep pan, heat ghee and then add the whole spices. Saute for a minute and then add onions and chilly. Fry till onion becomes translucent. 4. Add required water and salt. Mix well. Allow the contents to boil well. 5. Medium the flame, add the fried rice. Cover the pan with a lid. Occasionally stir the contents. 6. 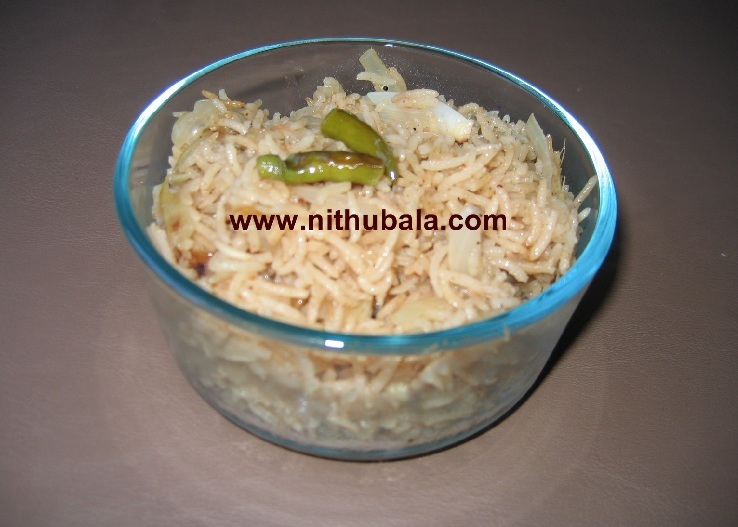 Once rice is cooked, season with ghee fried cashew and raisin. 6. Serve hot with any vegetarian gravy. Very Arometic simple rice. Nice recipe. Very yummy and delicious rice. ghee rice looks yum Nithu !